Video still of the redpoint crux on ‘GRA” 8B, Cova De l’Ocell, Catalunya. I was really trying to hold on, but didn’t quite make it this time. Right now I am in Spain. My climbing partner Alicia has broken her foot, so I am not doing my planned sport climbing and instead going bouldering. 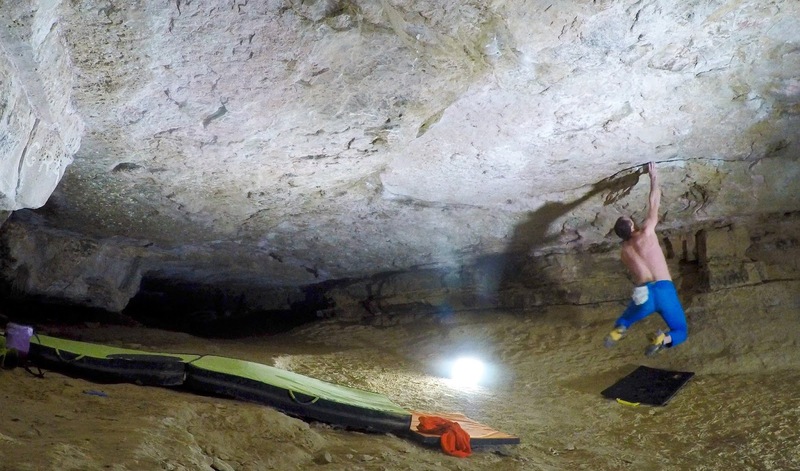 I spent some time visiting Cova de l’Ocell and trying the hard problems in there. Most of the problems finish of the same section of roof with a hard iron-cross move, which I knew would be challenging for my shoulder and a good test of whether I can get beyond ‘recovered enough to climb something’, to strong and able to climb something hard, i.e. complete recovery. I’ll admit that every time I do the move, it feels like my arm has been nearly ripped off on a rack. However, this feeling is getting less pronounced. And I still managed to get through this move on Independencia (8B) on my first try and finish the climb. Now I’ve been trying the other 8B (detailed at about 2 mins into this video) first climbed by Chris Sharma. I don’t know the name of the climb but I’m calling it GRA after the graffiti at the start. The other night, I nearly succeeded on it 4 times in a row, falling each time on the drop down form the iron-cross move. So this is a story of failure so far. However, on the attempt in the pic above, I had a really good moment. When you commit to the drop down without having caught the hold right, there is a risk you’ll deposit yourself onto your head on the ground. And I only have one proper mat on this trip. Despite this, I got super aggressive and really really tried to hold onto it, despite my feet coming off and being so outstretched that my shoulder was not properly engaged. If I were thinking about my recovering shoulder, I would have surely let go. But I wasn’t! I felt completely uninhibited and my body is obviously now comfortable to climb this way again. This marks a big recovery milestone. The ability to completely let go of inhibitions and give everything is critical for climbing at your limit. I'm delighted that my comfort zone is extending pretty close to the limits of my physical capabilities again. This is where I want to be. Lets see how the next few sessions go on it. *UPDATE* I went back a few hours after writing this and sent it.